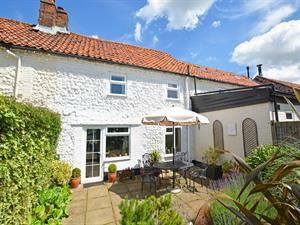 This lovely cottage set in the heart of the popular village of Docking is a delight waiting to be discovered. Part of a terrace of ancient cottages located in the Conservation Area of the village everything is to hand for a romantic holiday for two. The beamed living/dining room with inglenook and multi-fuel stove is full of character and leads into a well-equipped kitchen, which features lovely old oak uprights in the walls a tell tale sign of the age of this cottage, which was built in the 16th Century. Upstairs there is a bathroom and spacious bedroom with a king-size bed that overlooks the pretty and sunny patio garden. Cardinal's Cottage offers weekly bookings starting on Friday.